Room on the Broom by Julia Donaldson is a wonderfully fun book for Halloween but it can be enjoyed any time of year. 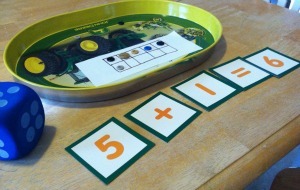 It's an especially great text to use when learning the concept of addition as putting together and adding to a number. In Room on the Broom by Julia Donaldson, a witch and her cat are flying on their broom stick when misfortune strikes in the form of a gust of wind. 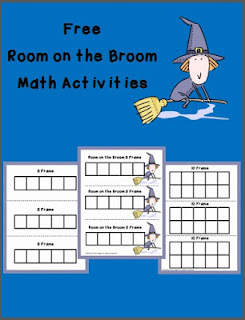 The witch and her cat are knocked off their broom stick. While they are on the ground, a dog asks to join their flight on the broom. The generous witch obliges and so the story goes on. Each time the witch gets knocked down, she pops back up with one more friend riding along. In the end, her generosity pays off as she is able to escape a terrible dragon with the help of her new friends. The ending offers a creative solution to the dragon and her broken broom. When I was reading the book with my son, Logan, I noticed that he was constantly making connections to the story and the concept of adding one. I wanted him to practice determining quantity when one object is added without having to count the objects. I gave him a 5 frame and 5 buttons. As we read the book, he added a button to the 5 frame to show the number of people/ animals on the broom. As he added one more, I would ask him, "Can you tell me how many buttons without counting?" After we had done the activity in the order of the book, we practiced the skill by playing a dice game. Logan would roll a dice and add that many buttons to the 5 frame. (If he rolled a 6, he took another turn. If he rolled a 5, I'd ask him how many more he could add - zero!) After he made his number, I'd ask him to add one more to his 5 frame. Then I'd ask, "Can you tell me how many buttons you have without counting?" We also had number cards, so we built the addition sentence to match. He did so well with the five frame, we also used a 10 frame to play the game. 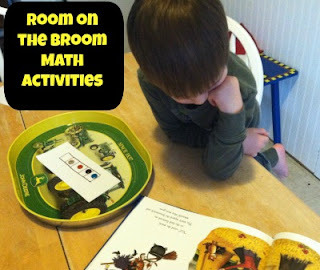 Room on the Broom is a wonderful text to use to explore early math concepts. The illustrations in the story are captivating and the rhyme pattern is nicely done. Julia Donaldson's books are (always?) rhyming and are wonderful to use with children who are developing phonological awareness. Donaldson is the featured author of the VBC for kids this month. You will be able to find activities, recipes, games, and more to accompany many of her books in the linky party below. 1. Link up only posts that involved Julia Donaldson books. Any other posts will be deleted. 2. Visit other blogs in the linky and comment and share the ones you like. 3. Add our Virtual Book Club to your post if you'd like. 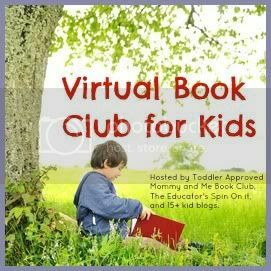 Also, check out the Virtual Book Club for Kids Pinterest Board. Follow me on Pinterest for more educational resources. 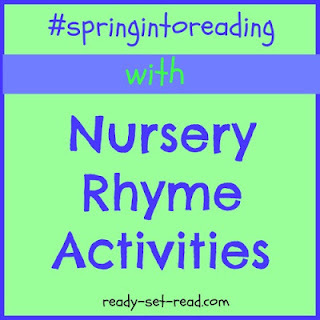 Coming this Wednesday to Ready-Set-Read- A 5 Day Series of Nursery Rhyme Activities for Easter and Spring. I'd love if you'd hop back over for it! 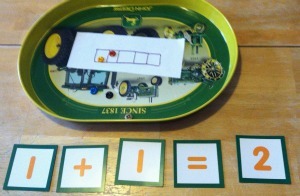 Such a clever idea to incorporate math! Thanks for the printables. This is such a smart and creative idea. Especially love that you incorporate the activity with a book. Thanks too for the sweet comment you left on my blog. Cheers to our little train conductors! Logan is making good progress learning to conserve number! That is a big step toward addition! Thanks for visiting here as well. I'm completely obsessed with your blog-- and your cute ideas. Here's the link to her blog if anyone else wants to check out. Her stuff is amazing! cute activities! thanks for sharing! Hey, thanks Erin! Hope you enjoy them!